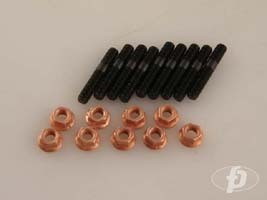 Exhaust Manifold stud & nut kit for 6 bolt or 7 bolt DSM. Also available for Evolution Lancer, just select the 7 bolt version. OEM quality studs and copper plated locknuts. Want this item shipped out tomorrow, April 24? Order within the next 22 hrs 39 mins.